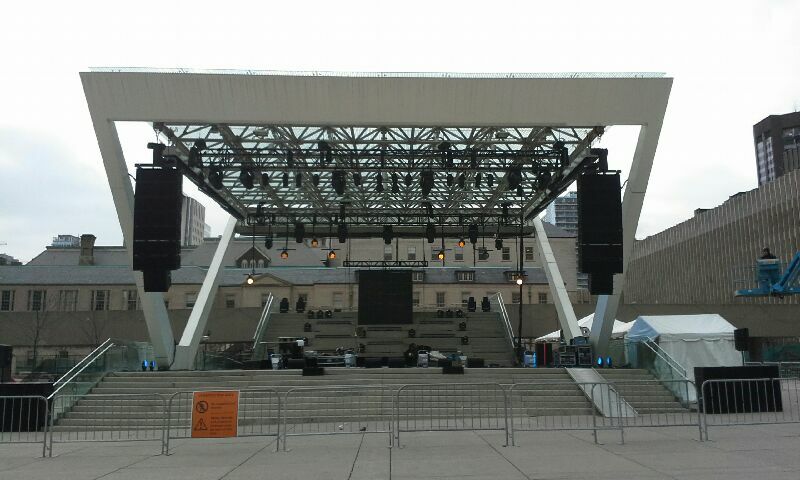 On December 31st we supplied production to the City of Toronto’s 30th annual FREE New Year’s Eve Bash at Nathan Phillips Square on their new permanent stage. The evening featured a variety of musical and interactive exhibits including street curling, a Sportsnet Magazine photo booth, food trucks, musical performances and DJ’s! The evening capped off with a vivid display of midnight fireworks as all 50,000 attendees welcomed in 2015. We supplied the audio for the event which included, L’Acoustics Vdosc and DV Dosc cabinets for main audio hangs and AVID SC48’s for FOH and Monitor consoles. A full selection of Shure, Sennheiser wireless with EV XW12 Wedges rounded out the monitor reinforcement system.